The “Big Five” ethnic organizations, along with Engaging Education, Student Union Assembly, SOAR and the Bike Co-op — will have to relocate for the 2015-16 school year. Photo by Camille Carrillo. The Crown Pit at night. Photo by Alex Posis. 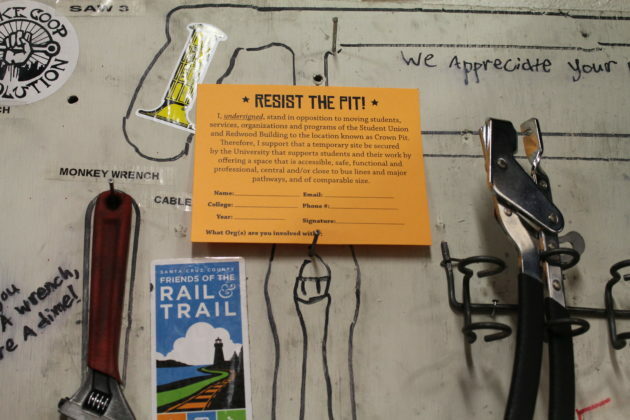 The “Resist the Pit” petition states signers support a site be secured by the university that supports students by offering a space” that meets SUGB’s non-negotiables. Photo by Camille Carrillo. 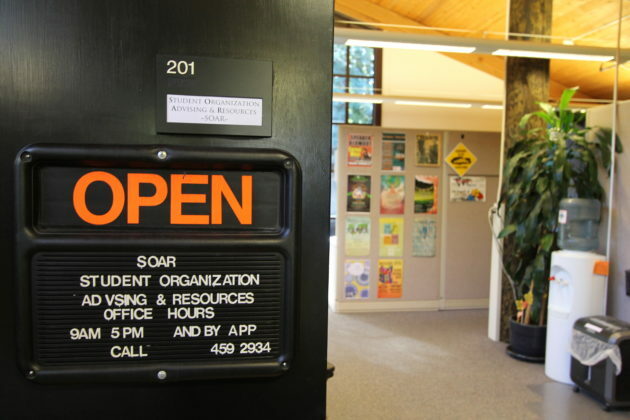 SOAR estimates 5,000 student visits in 2014 to its office in the Student Union. Photo by Camille Carrillo. Student Organization Advising and Resources’ (SOAR) total estimated registered student organizations membership is 5,775 this year. Photo by Camille Carrillo. Filipino Student Association members Chris Arellano, Katherine Aranda and Kris Lapu work in available office space in the Redwood Building. Photo by Camille Carrillo. Five members of the Student Union Governance Board (SUGB) slid a cardboard box across the table to Executive Vice Chancellor (EVC) Alison Galloway, one of UC Santa Cruz’s top administrators, on Feb. 18. Inside the box were 1,172 bright orange signed petitions — collected in 24 short hours. The SUGB wanted to send a message to the administration on behalf of the thousands of students who use the Student Union and the Redwood Buildings — that students oppose the proposed plan to temporarily move current tenants of these spaces to trailers in the parking lot behind Crown College, commonly referred to as the “Crown Pit.” Both buildings will be closed next year for mandated construction to make the buildings earthquake-safe. African/Black Student Alliance (A/BSA), Asian Pacific Islander Student Alliance (APISA), Movimiento Estudiantil Chicana/o de Aztlán (MEChA), Filipino Student Association (FSA) and the Student Alliance of Native American Indians (SANAI) are the “Big Five” ethnic organizations that work out of the Student Union, along with the Student Union Assembly (SUA) and Student Organization Advising and Resources (SOAR) staff. 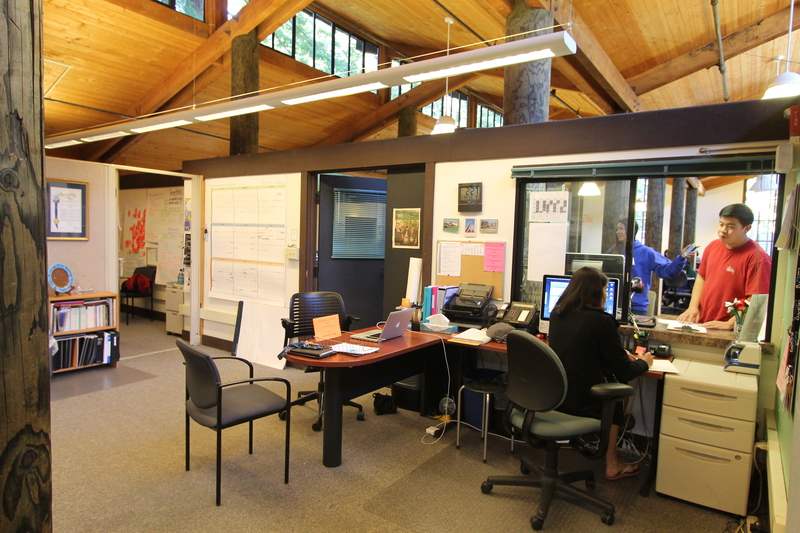 e2 works out of the Redwood Building, and the Bike Co-op rents space in the back of the building. Dean of Students (DOS) Alma Sifuentes said, in retrospect, she can see how students may feel their move to the Crown Pit shows a lack of care about the work these organizations do. But, considering the limited available options on campus, she said the “decanting” space will never be ideal. Since the Crown trailers have been used as temporary relocation spaces before, Sifuentes said the complaint is less valid. Over the last two years, SUGB has maintained the same non-negotiables — accessibility, safety, centrality and functionality — for its temporary space, even before the Crown Pit was suggested as its temporary location. 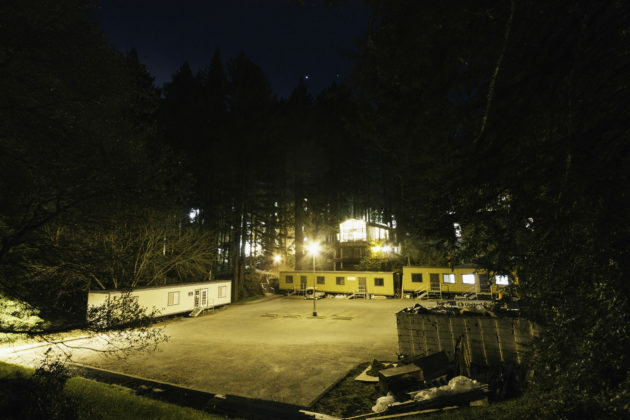 Board members said despite the upgrades Sifuentes and Galloway have offered to the Crown Pit, like three additional trailers and lighting, it’s still not a reasonable option. Since the meeting with Galloway, SUGB has a total of 1,500 signed petitions, which state that the signers stand in opposition with the move to the Crown Pit, and demand the university secure a space that meets the board’s non-negotiables. Students in and out of the organizations being relocated continue to collect petitions. Guerrero expanded on how the Crown Pit doesn’t provide enough space, is not centrally located on campus or close to bus stops or major pathways, and is too dark at night and inaccessible to people who aren’t able-bodied. 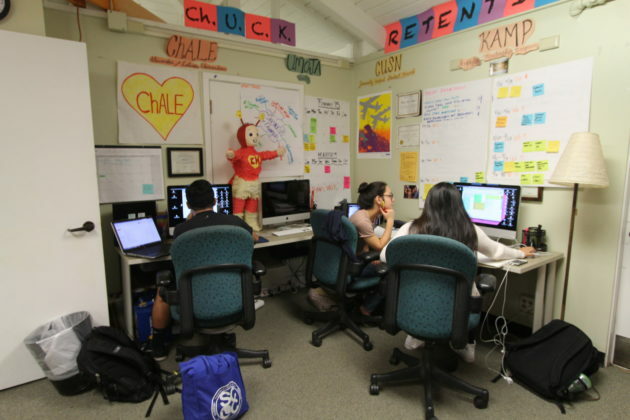 Students have also vocalized concern regarding the displacement of several ethnic organizations and retention programs that help the university bring students of color to UCSC through student-initiated outreach programs, and ensure they graduate. 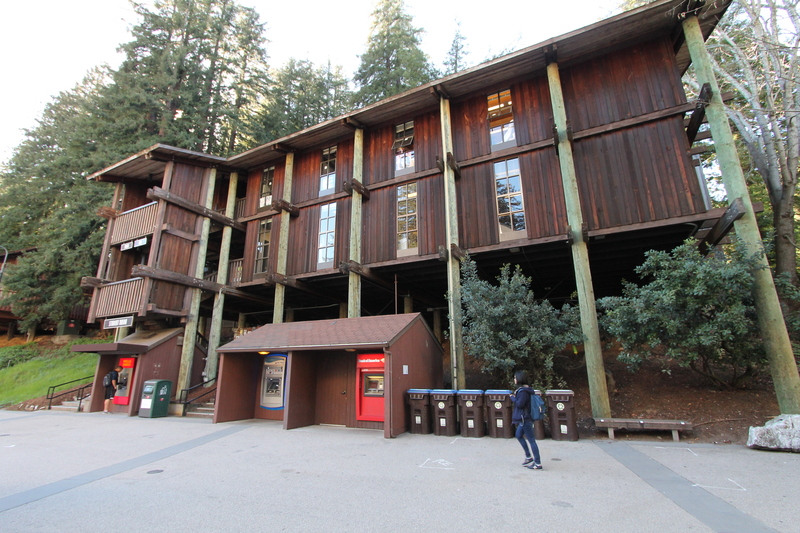 The Student Union and Redwood Buildings retrofit is part of Student Life Seismic Corrections Phase 2, an $8.25 million project to correct structural deficiencies in buildings with “poor” seismic ratings in 2005, including KZSC, the Cantú GLBTI Center, the Student Union and the Redwood Buildings and the Cardiff House Women’s Center. Phase 2A of the project specifies the Student Union and the Redwood Buildings and the Cardiff House. The $5.05 million seismic retrofit project for 2A will be funded by three student fees — $4,136,000 for seismic and life safety work through the Seismic/Life Safety Fee, $764,000 for deferred maintenance elements through the Student Services Fee and $150,000 for sustainable improvements through the Green Building Fee. Student fees are paid for alongside tuition, and most often are approved through SUA elections, but the Student Services Fee is mandated by the UC regents and the Seismic/Life Safety Fee by the UCSC chancellor. The UCOP Committee on Finance notes from March 14, 2007 call the Seismic/Life Safety Fee UCSC’s “primary fund sources to address the safety needs of student services facilities” and said the increase was necessary to ensure the health and safety of students. It helped fund structural improvements to the Health Center and the West Field House. Annually, the Seismic/Life Safety Fee generates $1.9 million and the Student Services Fee $1.4 million. Chancellor George Blumenthal increased the Seismic/Life Safety Fee from $25 per student per quarter to $40 per student per quarter in 2007. Last week, the Student Fee Advisory Committee (SFAC) was presented with a $767,000 budget augmentation for Phase 2A to cover “unanticipated changes in project scope,” including a request by the DOS to extend the deck between the Student Union and the Redwood Buildings for additional access. The augmentation would increase the funding needed fromeach of the three specified student fees. SUGB has been proactive in finding suitable alternate spaces for each organization’s temporary relocation. In a meeting with EVC Galloway last Wednesday, the board voiced that the Crown Pit remains a non-negotiable — despite any accommodations or upgrades — and Galloway discussed different potential spaces, like parking lots near Hahn Student Services and the Office of Physical Education, Recreation and Sports (OPERS). The board offered more options, including potentially underused buildings and rooms in College Eight and Social Sciences II. e2 Chair Adlemy Garcia pointed out multiple errors in the DOS office throughout the last year, also citing a discrepancy between the information students receive and what administrators know. She said SUGB wasn’t notified until late September of the March 1 deadline to send in the exact temporary relocation site to the UC Office of the President (UCOP). She also added that the Crown Pit trailer drawings given to the board didn’t include the correct measurements, and the assessment on how e2 functions in the Redwood Building, along with measurement of its space, wasn’t completed until early February. Sifuentes responded saying her office asked SOAR for its most recent measurements to use in finding a decanting space and acknowledged that the process could have gone smoother on behalf of her office and the SUGB. The tenants are set to move out by June 30 and move back exactly one year later. The space used by students in the Student Union and Redwood Buildings would decrease from 8,100 square feet to 2,500 square feet, if moved to the trailers in Crown, according to SUA’s “resolution to alternative spaces to the tenants of the Student Union and Redwood Buildings.” Sifuentes, however, said there’s 3,320 square feet of “usable space” in the Crown Pit. She said there’s a strong possibility the Crown Pit will also be the decanting space for KZSC and the Cantú Center in the 2016-17 school year while these buildings are seismically retrofitted. “If there are no other alternatives then there will be accommodations made to try keep the effectiveness of our programs the same, but we all feel that even with accommodations it won’t be the same — it’s like putting a Band-Aid on a really big wound,” said SUGB member and Student Union staff member Christine Bagaoisan. On Feb. 10, SUA passed a resolution supporting the SUGB’s commitment to find a more suitable relocation space, and added that SUA should be treated equally in this process. Last year, SUA went from being advised by SOAR to the DOS office. Sifuentes and SUGB are waiting on word from EVC Galloway about how the timeline is going, and if there are new potential decanting spaces available. Sifuentes said she is working on finding out from different departments like Capital Planning and Space Management and Physical Planning and Construction to see “if everything is in alignment, or if there’s opportunity to exploit some of that bureaucracy to buy time if we don’t have a decanting space that is going to work for the students.” Multiple attempts to contact Capital Planning and Space Management were unsuccessful. But Sifuentes still wonders, even with a further delay on the deadline to submit to UCOP and the project in general, if extra time will fix any problems. Director of Admissions Michael McCawley said tour guides will try to offer alternate routes wherever the impacted organizations are relocated for prospective students to visit these spaces. He said the tours will adjust to make the relocation “as least negatively impacting as possible,” but the change will be difficult, given that Quarry Plaza is where tours end. As of Feb. 25, the SUGB hasn’t received any new information from EVC Galloway since last Wednesday, and have requested a meeting with Galloway and Chancellor Blumenthal together. With the deadline for a final relocation decision approaching, the Crown Pit remains the only formal offer.